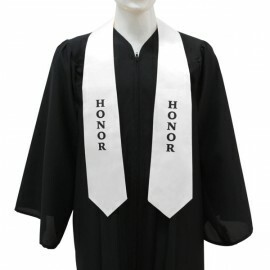 In honor and in recognition of your exemplary accomplishments, Gradshop.com has tailored to your academic achievements by offering these imprinted stoles at a sensible cost. The graduation stole is one prominent accessory to the academic regalia or dress for graduation that is typically seen fashioned by graduates during the commencement. Our stoles are made from high quality bridal satin and they are worn around the graduate’s neck and hang loose in front of them. 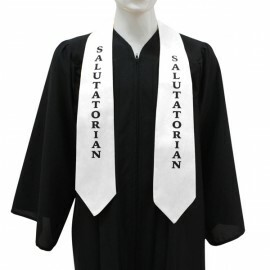 Gradshop.com’s Stock Imprinted graduation stoles are very popular for numerous honors bequeathed upon graduates such as being named Salutatorian, Valedictorian, or Honor. We offer stock imprinted stoles in both gold and white with the most popular silk screened verbiage such as Honor, Valedictorian, and Salutatorian. Our Imprinted Stoles are crafted with a perfect balance of design, style and sophistication. They come in the popular tip style, high quality bridal satin fabric, and fully lined. 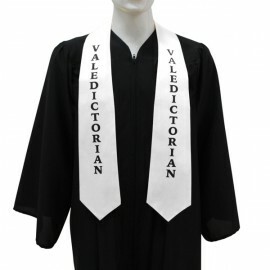 With our vast selection of College Graduation Stoles, we have it or we can make them in large quantities – we recommend that you view our custom graduation stoles! Gradshop's imprinted graduation stoles are certain to be your number one choice. They may be purchased individually or we offer increasing discounts when you buy in bulk quantities. Order now!